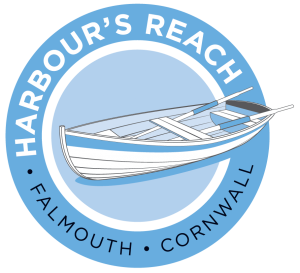 Nestled on a Cornish quayside in Falmouth, Harbour’s Reach holiday apartments are the perfect place to relax, unwind, indulge, enjoy and explore Cornwall. Drink in the magnificent panoramic harbour views from your very own private balcony or terrace. Whether you are looking for a summer getaway, a winter escape, a romantic break or a seaside retreat Harbour’s Reach self-catering holiday apartments are the ideal spot. Pop out for a leisurely breakfast, lunch or supper at one of Falmouth’s multitude of deliciously tempting local eateries. Be spoilt for choice – take a stroll along Falmouth’s four beaches, each with its own beach café – Castle Beach, Gyllyngvase Beach, Swanpool Beach and Maenporth Beach. Be blown away by the views as you walk from Gyllyngvase to Swanpool along the cliff tops. Hop on one of Falmouth’s many ferries or take a water taxi – explore meandering creeks, rivers, Cornish villages, National Trust gardens at Trelissick or even a shopping trip to Cornwall’s only city, Truro. Spot some of Cornwall’s amazing array of wildlife – bottlenose and common dolphins, porpoise, basking sharks, minke whales, seals, cormorants, egrets, herons, shags, kittiwake, chough, oyster catcher, kingfisher and many more. Why not take a wildlife-watching boat trip? Walk around Castle Drive, watch the local Falmouth Working Boats racing in the waters of the Fal and Carrick Roads, visit Henry the Eighth’s Pendennis Castle along the way (an English Heritage property with a great café and magnificent views over Falmouth Bay), look across the water to St. Anthony Head lighthouse and St. Mawes with its own castle marking the entrance to Falmouth waters, have an ice cream at Castle Point, wave to the passengers on a passing cruise liner. Take a walk along Cornwall’s coastal footpath and breathe in the amazing landscape that has inspired artists and writers for generations. Try Mylor and the Carrick Roads, or Swanpool to Maenporth, stopping for a relaxed lunch along the way. Explore the magnificent coastline of Poldark’s Cornwall – rugged shorelines, sandy beaches, ancient woodland. Discover Cornwall’s dramatic cliff-tops and beaches as featured in Rosamunde Pilcher’s novels and popular German TV series. Take in a round of golf at Falmouth’s Golf Club perhaps followed by a Cornish Cream Tea or a Cornish pasty. Spend a day at the world famous Eden Project. We aim to consistently provide high quality self-catering holiday accommodation while being sympathetic to the environment. We booked this at the last minute for a 7 night break. Tim was so helpful from start to finish. Apartment lovely with everything we needed, especially the amazing view over the harbour. In perfect position within walking distance of shops and eating places yet quiet and peaceful. Took the kayak down as Tim allowed us to keep it in lock up there. Plenty of room for getting our 4×4 vehicle in and out of archway and into parking space (just thought I would include that due to previous comments!) Would definitely book again. Fantastic place to stay, clean, very tidy and an unexpected welcome package of essentials. Right in the heart of Falmouth with plenty of bars and restaurants. A fantastic view from the apartment over the harbour, perfect place to unwind, will definitely be going again. This was our second stay here because we adore what it is and where it is. Tim and his staff were so welcoming and ensured our stay was enjoyable. The wonderful view of the harbour and amenities like shops and restaurants are within walking distance. These apartments were a real find. We received a lovely welcome and the welcome pack was a really nice touch. The apartments themselves are right in the middle of Falmouth and are clean and spacious but the best part was definitely the view – I didn’t want to leave! Falmouth was just busy enough for us and we took days trips out to St Michael’s Mount, Penzance, Lands End and Charlestown harbour. We would also recommend the river boat trip up to Truro for the day. Fabulous apartments and lovely place! From when I sent my first enquiry to an email hoping my journey home was OK, I could not have been more impressed with Tim’s help. The apartment exceeded my expectations and the view was outstanding. I am an avid reader and took 6 books with me. I only read one as the view was just too fantastic. I received a warm welcome from Fran, who helped me with my luggage. Later in the week she also gave me some good advice on a walk I had planned. The walks in the area are great. A trip to St Ives on the train is a good, easy day out. I planned too much for one week and will be back next year. A spotless, comfortable apartment with all you need for a good break, helpful and friendly staff and a view that can’t be beaten. We regret we cannot take pets.